Membrane bioreactor (MBR) is a biochemical engineering process involving the use of both (a) a suspended growth bioreactor for biochemical reactions (such as fermentation, bio-oxidation, nitrification, and denitrification) and (b) a membrane separator for subsequent solids–liquid separation. In a chemical engineering fermentation process, the solids may be yeasts and the liquid may be an alcohol. In an environmental engineering process, the solids may be activated sludge and the liquid may be the biologically treated water or wastewater. Practically speaking, the membrane separator replaces clarifier, such as sedimentation or dissolved air flotation (DAF) in a conventional suspended growth biological process system. The membrane module can be either submerged in a suspended growth biological bioreactor, or situated outside the bioreactor. 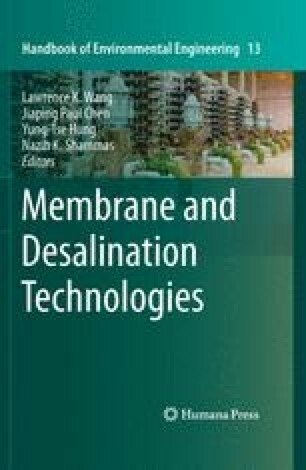 This chapter introduces historical development, engineering applications, various MBR process systems, design considerations, and practical environmental engineering applications, such as treatment of dairy industry wastes, landfill leachate, coffee industry wastes, cosmetics industry wastes, municipal waste, and potable water. Kippax V (2010) Importance of air scour in membrane bioreactor system. Water World 2(30). www.waterworld.com. Zenon Membrane Solutions. (2010) Cauley Creek Water Reclamation Facility. Zenon Membrane Solutions, Oakville, Ontario, Canada. GE Water & Process Technologies, Schenectady, NY, USA. www.gewater.com. Zenon Membrane Solutions (2010) Australian Golf Course Recycles Municipal Wastewater with Onsite ZeeWeed MBR. Zenon Membrane Solutions, Oakville, Ontario, Canada. GE Water & Process Technologies, Schenectady, NY, USA. www.gewater.com. Zenon Membrane Solutions (2010) Vancouver Convention & Exhibition Centre. Zenon Membrane Solutions, Oakville, Ontario, Canada. GE Water & Process Technologies, Schenectady, NY, USA. www.gewater.com. Zenon Membrane Solutions (2010) Johns Creek Environmental Campus. Zenon Membrane Solutions, Oakville, Ontario, Canada. GE Water & Process Technologies, Schenectady, NY, USA. www.gewater.com. Zenon Membrane Solutions (2010) Corona Wastewater Treatment Plant. Zenon Membrane Solutions, Oakville, Ontario, Canada. GE Water & Process Technologies, Schenectady, NY, USA. www.gewater.com. GE Water & Process Technologies (2010) Membrane Bioreactor Design Considerations. http://www.gewater.com/products/equipment/mf_uf_mbr/mbr/design_considerations.jsp GE Water & Process Technologies, Schenectady, NY, USA. www.gewater.com.